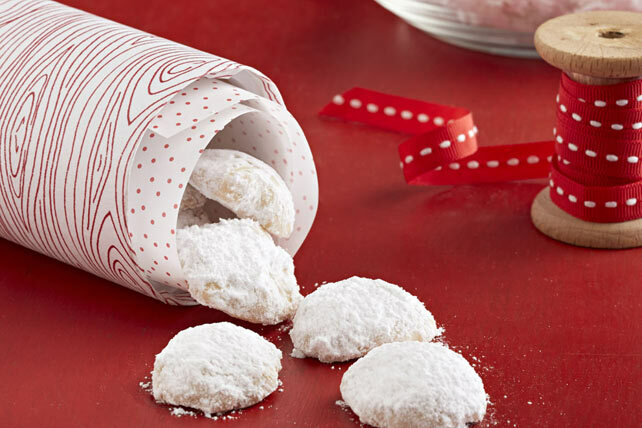 Vanilla shortbread rolled in snowy sugar for a perfect holiday treat. Mix flour, corn starch and salt until blended. Beat butter, cream cheese and 2/3 cup sugar in large bowl with mixer until blended. Add vanilla; mix well. Gradually add flour mixture, mixing well after each addition. Roll dough into 1/2-inch balls; place, 1/2 inch apart, on parchment-covered baking sheets. Bake 25 to 28 min. or until bottoms are golden brown. Cool on baking sheets 1 min. Remove to wire racks; cool completely. Place remaining sugar in medium bowl. Add cookies, in batches; toss to evenly coat with sugar. Gently shake off excess sugar. Substitute vanilla paste for the vanilla.